If you thought a 40-year-old injustice had finally come to an end via a Florida state governor's decision to pardon deceased Doors singer Jim Morrison for an allegedly indecent performance in Miami in 1969, than you thought wrong. While earlier this month (December 9) Florida Gov. Charlie Crist chose to pardon the vocalist's indecent exposure charge, which reportedly stemmed from Morrison sticking his hand in his pants, among other things, the remaining Doors aren't satisfied with the gesture. 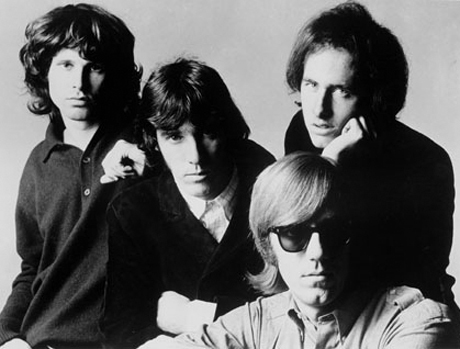 A statement [courtesy of the New York Times] written by remaining members Robby Krieger, John Densmore, and Ray Manzarek rejects the posthumous pardon, suggesting Morrison never should have been charged in the first place. "We don't feel Jim needs to be pardoned for anything," the statement reads. "His performance in Miami that night was certainly provocative, and entirely in the insurrectionary spirit of the Doors' music and message. The charges against him were largely an opportunity for grandstanding by ambitious politicians -- not to mention an affront to free speech and a massive waste of time and taxpayer dollars." Despite the lip-service the group are now getting from the Florida state government, the band are sticking up for their fallen frontman, whom they believe was wrongly charged. Even years after Morrison's death, the Doors are preserving his memory and his first amendment rights. In 1969 the Doors played an infamous concert in Miami, Fla. Accounts vary as to what actually happened onstage that night. Whatever took place that night ended with the Doors sharing beers and laughter in the dressing room with the Miami police, who acted as security at the venue that evening. No arrests were made. The next day we flew off to Jamaica for a few days' vacation before our planned 20-city tour of America. That tour never materialized. Four days later, warrants were issued in Miami for the arrest of Morrison on trumped-up charges of indecency, public obscenity and general rock 'n' roll revelry. Every city the Doors were booked into canceled their engagement. A circus of fire-and-brimstone "decency" rallies, grand jury investigations and apocalyptic editorials followed -- not to mention allegations ranging from the unsubstantiated (he exposed himself) to the fantastic (the Doors were "inciting a riot" but also "hypnotizing" the crowd). In August Jim Morrison went on trial in Miami. He was acquitted on all but two misdemeanor charges and sentenced to six months' hard labor in Raiford Penitentiary. He was appealing this conviction when he died in Paris on July 3, 1971. Four decades after the fact, with Jim an icon for multiple generations -- and those who railed against him now a laughingstock -- Florida has seen fit to issue a pardon. We don't feel Jim needs to be pardoned for anything. His performance in Miami that night was certainly provocative, and entirely in the insurrectionary spirit of the Doors' music and message. The charges against him were largely an opportunity for grandstanding by ambitious politicians -- not to mention an affront to free speech and a massive waste of time and taxpayer dollars. As Ann Woolner of The Albany Times-Union wrote recently, "Morrison's case bore all the signs of a political prosecution, a rebuke from the cultural right to punish a symbol of Dionysian rebellion." If the State of Florida and the City of Miami want to make amends for the travesty of Jim Morrison's arrest and prosecution 40 years after the fact, an apology would be more appropriate -- and expunging the whole sorry matter from the record. And how about a promise to stop letting culture-war hysteria trump our First Amendment rights? Freedom of speech must be held sacred, especially in these reactionary times.